Roller skaters and alligators: A devastating combination. Part 2 of Another Derby. To many, most forms of roller derby played in the 1970s through to the end of the decade were “fake,” in that many of the maneuvers players pulled off and circumstances rivals found themselves in were in no way “real” in the same way the happenings of the sporting contests of today are. Although at the time, much of the public perceived old-school derby as a genuine sport, there was some manipulation behind the scenes to help ensure games would always be close and competitive. For example, key plays would be pre-planned so as to close up a big points gap in a hurry, or create an exciting finish to make the home team win the game, even if other portions of the game were played legitimately. Fist-flinging and hair-pulling sequences were also often planned to happen when the moment was right, with some older versions of derby doing it more often than others. Roller Games shows were the worst offenders. 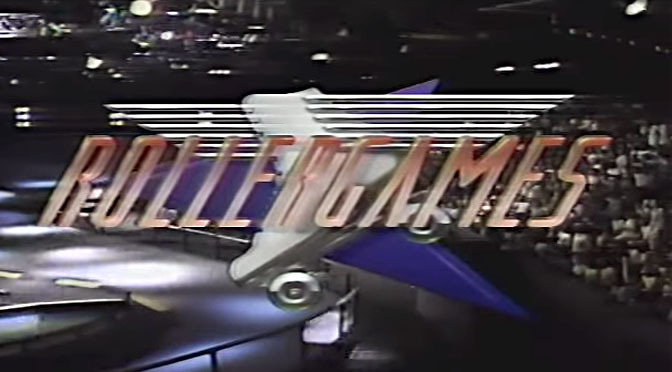 On Rollergames, for example, the pre-game show would always highlight a match-up of two opposing players and tell viewers to watch out for them. Then as if by coincidence, those players would find each other on the track later in the broadcast and proceed with the fisticuffs. You can’t blame players in the modern game for looking back at the era of phony derby and wanting absolutely nothing to do with it in the quest for legitimacy. As most would say, the derby of the past was all fake, and the derby of today is all real. Don’t get the two mixed up, because they’re not the same. The biggest misconception about roller derby’s WWE-like era of staged performances was that it was completely fake. This is completely untrue. What was certainly “fake” about fake derby was that players were essentially told what to do and when to do it. But if you think about it, that’s no different than an actor in a football movie being told what to do by a script and when to do it by a director. It’s just that no one would believe something like that would actually happen in reality. In a certain light, old-school roller derby, Rollergames, and other “fake” versions of the game played in the past were live movie performances of the “real” versions of the sport. What they were playing was definitely a real sport—or could certainly be played as a real sport—it’s just that the circumstances they were being played under demanded that their audiences be entertained at all hours. This is why there was a script that called for an exciting game every time out—without one, there was a very real chance that a few (real) blowouts in a row could hurt ticket sales and potentially financially doom the promotion. They still had to do it. The roller derby players of yesteryear were just as much athletes as they were performers. They trained every day. They were strong and powerful from head to toe. They could do things on roller skates that the Average Joe could barely do in sneakers. They were skaters. Real skaters. Just like the best players of today. The theatrical era of roller derby is no different than that of professional wrestling. Wrestling is “fake” because of the storylines and scripted outcomes. But wrestling is also very real because of the athletes and the remarkable feats they perform in the ring. Yeah, that overhead suplex off the top rope was a part of the script. They helped each other get up there, sure. But holy crap, that guy just picked up a fully grown man and flipped him over his head like a ragdoll!! There’s no way they’re “faking” things like massive feats of strength or technical ability unless they’ve got the wrestlers connected to invisible ropes and pulleys. You can’t put spectacular maneuvers like that into the script unless you have highly-skilled athletes capable of performing those actions convincingly, which is why it’s no surprise that many of wrestling’s past and current stars have legitimate sporting backgrounds in football, mixed-martial arts, or even bona fide amateur wrestling. So even in Rollergames, the “fakest” of the fake versions of roller derby, there were very real things going on in it that one just has to step back and appreciate. The most astonishing thing about the show was the infamous Wall of Death. The size of it is just immense, and television screens do it no justice. Unlike a half-pipe, where gravity helps with building up speed down a vertical wall before going up it on the other side, getting up the Wall of Death from a flat-bottom surface required speed, power and good ol’ fashioned balls to not only launch up it, but skate on it, do flashy maneuvers on it, and then speed down it towards a giant jump ramp. That’s definitely not fake, no matter how you look at it. Other things about roller derby that are often embellished for effect were also not always completely faked. A player apparently going out of control heading for the outside rail tended to flip over the rail and land outside of the track quite easily. Many of those players probably could have stayed within the confines of the track if they really wanted to. Yet, there’s no denying physics; if you’re going fast enough2 and you don’t have the time to react, Newton’s laws dictate that the top half will continue to remain in motion as the lower part stops, and the middle acts as a pivot point on the rail. It’s easy to look back at all these types of plays and say all of them were done for show, but the fact was some of them were legitimate hits. After all, skaters can flip head-over-heels in hockey, and no one would even dream of saying those kinds of plays are faked for the show. So why do people insist all of them in derby’s past were? But even ignoring the embellishment of blocks, the advanced skill of some of the era’s top players mean there were some things they were capable of doing—even if they were scripted events—that are beyond that of most, if not all, of today’s modern players. Consider the consequences of what might happen if one of these scripted extreme derby plays happened within the modern roller derby rules environment, specifically on the banked track. 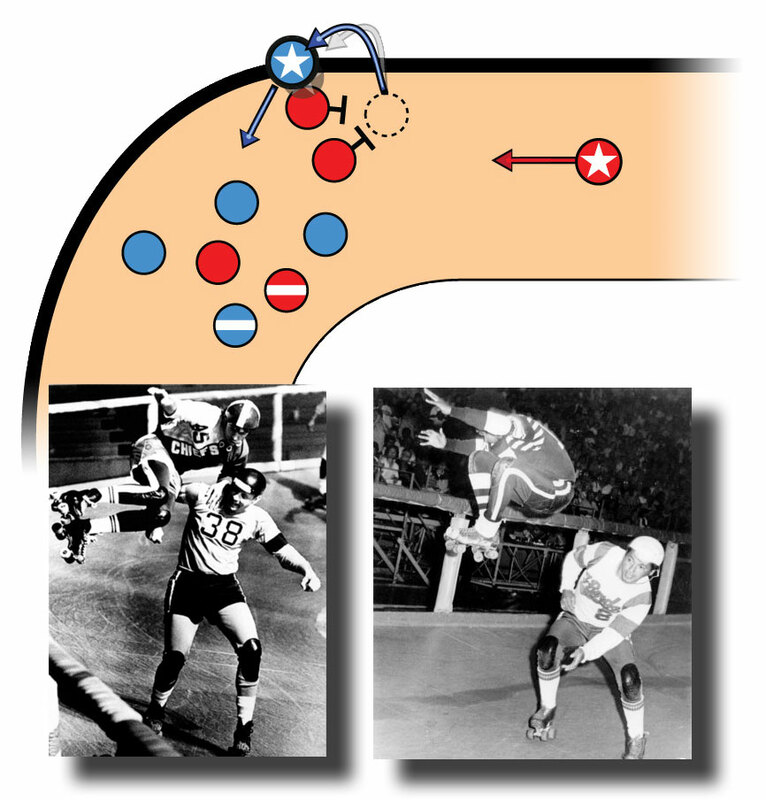 Instead of going through or around the rear red blockers (as modern players might do) the blue jammer instead jumps onto the rail and then jumps over and around the red players. Here are some photos of similar plays taking place in derby’s past—would this be acceptable today? Is this fake derby? Was this only possible because both teams were in on the play? If someone in the modern game tried a stunt like this, would they be ejected for showboating and faking it up? Actually, they wouldn’t. Because under modern rules, this type of maneuver—the same maneuver that might be scripted in an environment with fewer or no real rules—would be completely legal. 6.14.1 Players must remain within the boundaries of the track. In bounds means they do not have a skate or any part of their body touching the infield or the outfield. A player who has a skate in the infield is considered out of bounds until she has re-entered by placing both skates on the track either together or separately. A player leaning on the rail is considered in bounds. A player in the air is considered in bounds if her skates were on the track and not in the infield when they last touched the ground. Apex jumps to get around blocks to the inside are legal. Someone with the advanced skills to do so can take the next logical step and jump off the railing to get around blocks to the outside. The main point of emphasis in differentiating between the era of “old-school” derby and modern derby has been whether or not the derby being played was fake or real. But “real” can mean different things to different people. Jumping onto and then running across the rail while on skates is real as it is legal. What was believable, and what was unbelievable? There’s an irony about derby’s sports entertainment past. At its peak in the early 1970s, the best “fake” derby could ever be was completely believable. People bought into what Jerry Seltzer was selling because to them, it was a believable sporting competition. Newspapers covered it as if it were one, too. Seltzer took great care to maintain this believability within his version of the game, because he knew, like his father before him, that once people stopped believing it, they’d stop coming. Bill Griffiths didn’t realize this with Roller Games shows until people stopped coming. You can only make the unbelievable believable so many times before people suspect something’s amiss. Contrast this with real sports, where the unbelievable happens all the time. You hear sportscasters say things like “you can’t script this” as an incredible come-from-behind victory is unfolding, or inhuman individual performance is talking place. The reason why you couldn’t is because no one would believe it could actually happen in real life if it was put to film. This is the difference between genuine sports and sports entertainment. In real sports, you have incredible athletes doing things that are unbelievable within actual reality. In sports entertainment, you have incredible athletes doing things which are only believable within the context of a different, sometimes very strange reality. Even through this is a significant difference, the fact remains that for both of them to work well and to be successful, you need to have incredible athletes going through the motions. It’s misguided for many in roller derby today try to distance and separate themselves from everything about roller derby’s checkered past. Hundreds of real-skating athletes who played the game under circumstances beyond their control would have been glad to play the game legitimately more often than the limited opportunities available for them to do so. Heaven knows they were physically capable of it. There’s also the fact that the game rules used in derby’s scripted era were no less real than the game rules being used today. Just because Rollergames featured a figure-8 track and a jump doesn’t mean their game wasn’t real, because there’s no such thing as a game with “fake” rules. Silly rules, yes. But there’s nothing that would prevent two modern teams playing a legitimate game against one another under the general framework of Rollergames rules, Wall of Death and all. As modern roller derby continues to grow, it might be prudent to look back at the past “sports entertainment” forms of the game, filter out the “entertainment” parts, and then use the “sports” parts to try and come up with solutions to current problems or meaningful additions to game rules that might make it better for everyone. Roller derby has been around for almost 80 years now, and for the modern era—which is now barely a decade old—to ignore everything from derby’s past history just because some parts of it were scripted, embellished, or “faked” is doing a disservice to sport and the athletes that used to play it. Maybe the stuff we’re trying to still figure out has already been figured out decades ago. It’s just those solutions may be hidden behind the curtain, if only we would look past the play being put on on the stage. This isn’t to say that modern derby should embrace everything about its past, of course. Roller Games and other fistfight-filled scripted derby ventures are ways of playing the game that we should all hope we never see on a large scale again, especially on television. That doesn’t mean those versions of derby didn’t have their moments of real roller derby. It’s those moments that we should respect and cherish today, because we might just learn something from them. Because the last thing anyone wants for modern roller derby is to go over the Wall of Death once more. In a nice coincidence, ESPN’s Grantland had posted a piece on the reality of “fake” professional wrestling about the same time this chapter was coming together that pretty much makes the exact same point. It’s an interesting read, because the history of wrestling and the history of roller derby have many parallels. There are probably very, very few players today playing banked track games that could generate the speed, and have the mass, necessary to make a rail-flip happen legitimately, especially because there’s so little jammer-on-jammer action for a good, legal block to create the circumstances of an out-of-control player in the first place. Plenty of players have fallen out of the track completely, however, albeit under the rail instead of flailing over it. Coincidentally, this is exactly how comic book superheroes pass the smell test. Can you believe Peter Parker got bitten by a radioactive spider which gave him spider-powers? If you can, everything else works because his subsequent adventures are otherwise based in the real world.